Taipei Customs (TPC), Customs Administration (MOF) of Taiwan busted an international gold smuggling group by working with the Ministry Of Justice Investigation Bureau (MJIB) Taoyuan city division and the cross-border cooperation with Customs of Korea. MJIB had targeted 8 Taiwanese, trying to smuggle 23 kg of gold from Taoyuan International Airport to Korea on November 5 and 6 this year. The total value was 30 million NTD, which implies the profits could be up to 3 million NTD. After launching an investigation and gathering cross-comparison of information, TPC and MJIB were able to narrow the target down to 8 suspects, including LIEU, CHEN, GUO, LAI, MAI...etc. Afterward, MJIB immediately contacted TPC and the Customs of Korea, and successfully ferreted out 2-4 kg gold taped on their body respectively at the Incheon Airport. And the suspects were taken into custody. 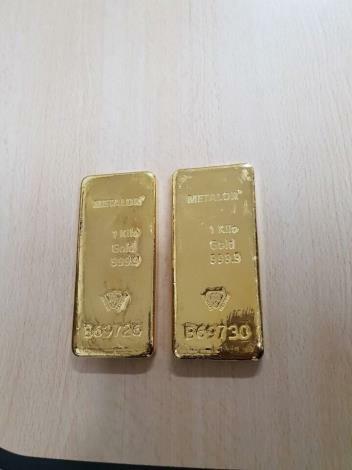 Recently TPC and MJIB had discovered that many Taiwanese, including this case, had deposited gold as bonded baggage while they arrived at Taoyuan airport from abroad, and collected them while flying back. Since the bonded gold had never left the airport’s restricted area, passengers could avoid the phase of customs clearance. Once the gold was collected by the passengers, it would be handed over to the third persons who smuggled the gold to Korea or Japan by means of tapping the gold on their bodies. Due to the high consumption tax of gold in Japan (8%) and Korea (10%), the international smuggling groups are willing to take high risk and hired the so-called “flyers” for smuggling gold to these countries to earn the tax-free profit in between. They usually target Japan as their destination and the transition is often conducted through corporate hands by cabin crews and ordinary passengers. However, after Japan Customs built the gold detector gates at almost every airport, the “Japan Path” became unsafe. Hence, the smugglers switched the target to Korea where they can even earn a higher profit. Taiwan is currently under the third run process evaluation of Asia/Pacific Group on Money Laundering (APG). APG put Taiwan in the “regular-expedited follow-up” list from the evaluation in 2011 and then “transitional follow-up” country in 2016. Therefore, the evaluation in 2018 will be very crucial. Taiwan has dedicated tremendous effort with the aim of getting back to the grade as “regular follow-up” list this time. Otherwise, its cross-border financial activities and international remittance will face great difficulties. The Executive Yuan of Taiwan government hopes to gain “5S” (Substantial level of Effectiveness) evaluation by APG this year. The successful investigation and detection of TPC and MJIB on the cross-border gold smuggling and money laundering case came right on the time to help with the APG evaluation and serves as a great example of cross-country cooperation. TPC also reaffirms to passengers, never try to smuggle gold or money abroad because of greed, the consequence will not only be the forfeit of gold but also facing serious lawsuit abroad.